Compatibility: Requires iOS 10.10 or later. Designed for those people who’re looking for a full-featured app to manage daily life better. 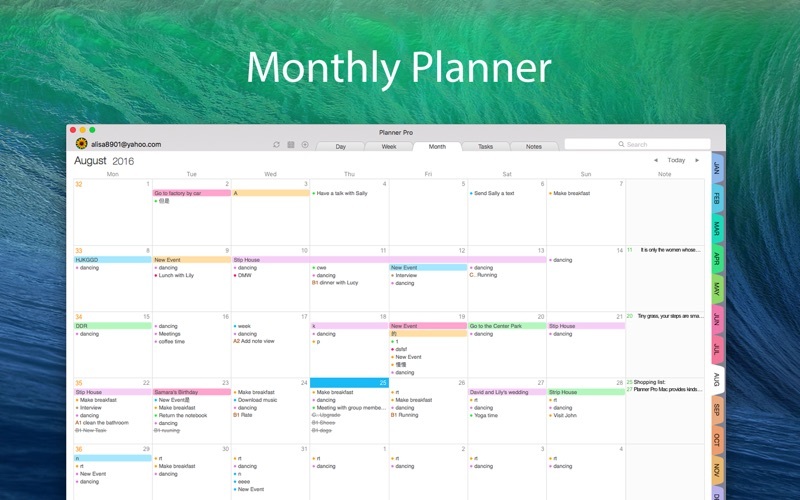 Planner Plus, which costs years for designing and coding is now coming out for everybody. We combine events, tasks and notes in one place so that you do not need to spend extra money for other apps. Planner Plus provides kinds of settings for different requirements from kinds of people. You’ll find the best way to meet your requirements in our app. Also, if you have any other great ideas or suggestions to make this app better please contact us with an email, which will be very appreciate. Events - Sync with iOS calendars and events - Show or hide calendars as you want - Add, edit or delete events easily - Supports full recurring period - Manually time slot - Supports all-day & cross-day events Tasks - Supports tasks and projects with sub-tasks - Supports recurring tasks and projects - 5 different status for tasks and projects - 4 priorities for tasks and projects - System reminder for each task Notes - Unlimited number of notes for each day - Manage notes in day, week and month view - Easily to add, edit and delete notes Other Key Features - Day, Week, Month and Tasks modules for better management - Very well designed user interface - Set the first day of week manually Please write to us before leaving negative reviews, as we can often help with your problem or help you better use this app. If you have any problems or suggestions please send a mail to plannerplus@appxy.com, you’ll get a response in a short time. The Mac app is steadily getting worse. I've been using it for 3 years and there are bugs that seriously need to be fixed. I hate that I cant get in touch with a developer either. One update a year isn't cool. When i try to set an event, now I cant change the times, and the actual app is always crashing. I had this app for some time before I really started using it. I liked the layout but I was using another app that seemed more modern. Slowly, though, I realized that I did not need all the nice features in the other app and that what I really wanted was a place where I could start the day with an overview of what was ahead not only for the day, but for the week or month, if I needed it. Prioritized, organized, and presented in an easy-on-the-eyes layout. 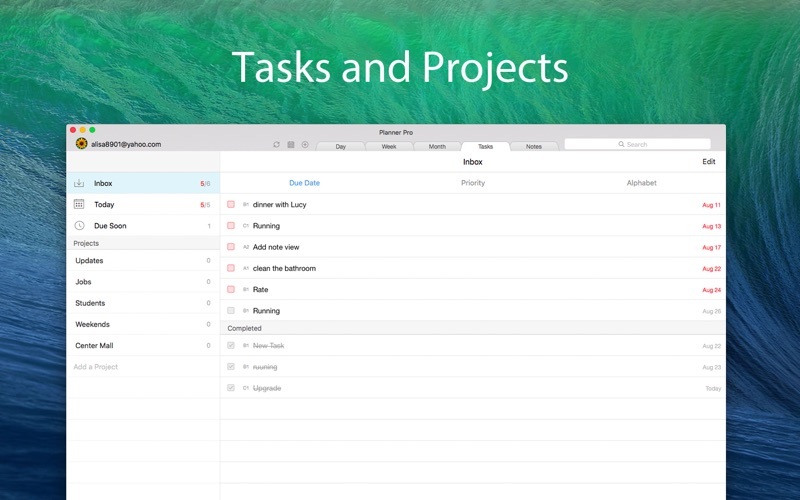 I like it that the tasks, when checked, go to the bottom of the list with a line drawn through each one. Oddly, I think the icon for the app itself put me off for quite awhile. I get that the quill suggests a contemplative approach, but... is it maybe a little tacky? Anyway, I have not had the sync issues that some others have complained about and overall this app meets my needs in a way that is enjoyable for me to use. I have looked at so many calendar apps it's a little nuts. This is exactly what I wanted as far as the layout. I could not get away from the paper planners because I wanted to be able to see all of my appointments and To Do list in one place on one screen. This does that. It is not a project management tool in my opinion. This is a planner for one person. 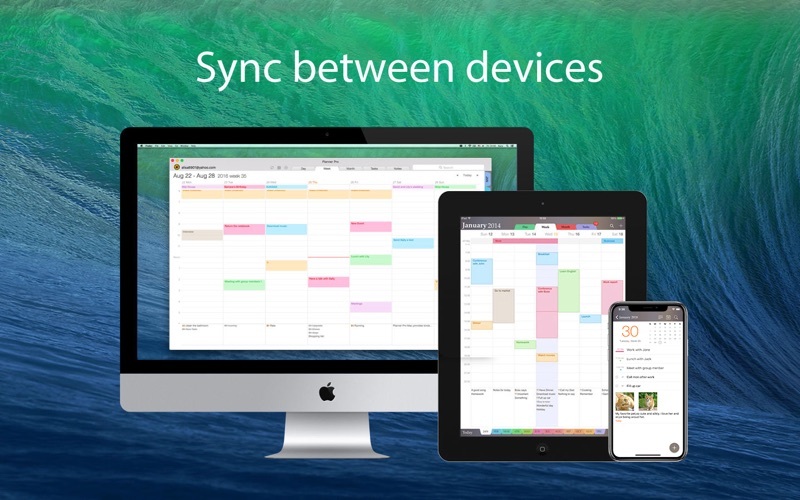 I've been using it a few days and it syncs between my iphone, ipad and mac computer. 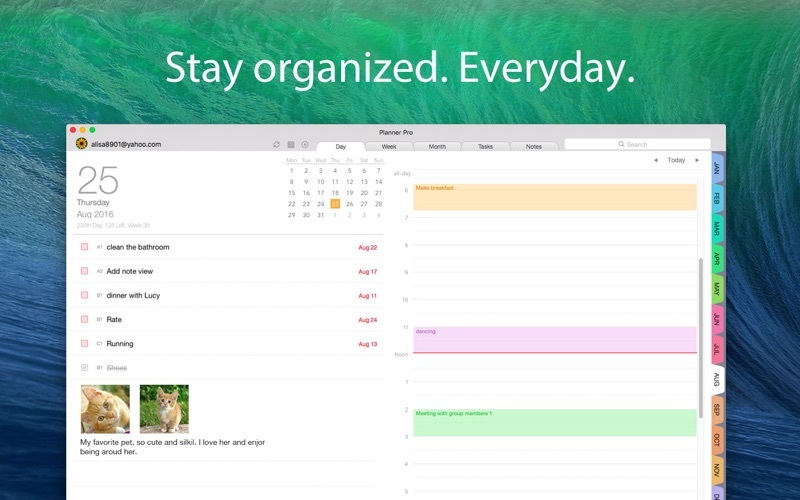 it also shows all of my calendars: google calendars, mac calendars and other app calendars. The #1 complaint I have is that I cannot invite any attendees to my events/meetings, etc. That's a pretty big flaw for a calendar app and I hope they fix it. I purchased Planner Pro for my ipad and iphone as an Apple Calendar alternative. I was especially looking for a calendar with integrated to-do lists with priorities. 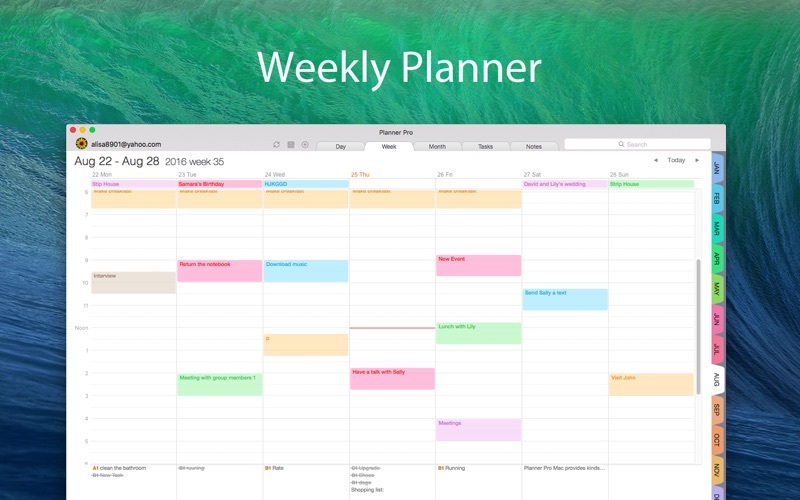 I was excited to find Planner Pro and it worked well enough for iOS devices so I took the expensive plunge for the Mac application. After using it for about a month I can safely say I hate it. I hate the interface, font, lack of instructions/help for troubleshooting and *worst of all* it will NOT reliably update or synch. You can click the tiny "update or synch" button and it spins around - NOTHING happens. I have quit and re-opened the program more times than I can count, as well as re-start my computer. On it's own terms, at a random time, it will synch with my current iphone/ipad Planner Pro. I am done with this program and I'm requesting a refund. It is *way* too expensive to be this frustrating and lousy. The planner is not linking with my iPad or iPhone. I prefer the version for the iPad honestly. The version for the Mac seems to have a lot of glitches. And there is no information to contact the seller to see if the glitches can be fixed. This app - in design - is exactly what I need. It allows me to prioritize tasks with A-B-C 1-2-3 (a la Franklin Covey), create “projects” with multiple tasks and varying deadlines, has a notes section, varying calendar views so I can see daily/weekly/monthly, etc. I paid for and downloaded the desktop app, iPad app, and iPhone app as I wanted my info with me wherever I go. My issue has been that items don’t seem to sync, and the desktop app is the only one that has a “refresh” button that I can find. So my IPhone keeps alerting me to tasks that I marked as completed weeks ago on my desktop, and neither my desktop nor my phone are showing calendar events and tasks that I added to my iPad. I want them to automatically sync, and if there’s a way to do it, it’s not intuitive or easy to find (and it’s certainly not automatically happening). Because of the costs associated, this could easily be a 5 star review if the syncing worked more reliably and consistently. As it is, I struggle to get it to work at all most times. If this is remedied, I’ll definitely adjust my review. 1. The Apple Store's App Support link leads to a splash screen that touts the developer's other products. Planner Pro is NOT listed as an available app. 2. The Help Center links at the developer's Beesoft Technologies website (http://www.beesoft.io) are dead. The links to its other products (scanner, fax, expense apps) are alive. 3. A Google search for "Planner Pro" turns up a different app advertised by a different company. Dwonloaded the app for my MacBook and iPhone. it seems to work much better on my iPhone than my MacBook. Couldn't find the settings on my App so i tried to contact the developers. Can not contact the developers because they don't link any way to contact them on the website that Apple provides. The product is buggy and unfinished and the developers don't seem to care. I'm furious. Hands down, its absolutely terrible. It's absolutely unusable on my MacBook unless I have my iPhone to help fix and edit the notes and events. I want my money back. Do not buy this product. Wonderful Planner with prompt customer service! I have tried out so many digital planners and been searching for something to replace the paper DayRunner and Franklin Planners I’ve used in the past. There are other good planners out there, but this is perfect for someone needing a personal planner who has many projects, tasks, and appointments, and the need to integrate between devices and calendars. The interface coud be a bit more convenient in places, but everything works so well and syncs within a few minutes. I’m very happy with it.